What’s your favorite neighborhood in Sydney? Artsy Alexandria. Beachy Bondi. Vintage Glebe. Historic Millers Point. Beautiful Palm Beach. You should get to know all of them. Start with Woolloomooloo. You’ll fall in love with the waterfront area before you can even learn to pronounce its name correctly. Woolloomooloo, one of Sydney’s eastern suburbs, sits on the opposite side of the Royal Botanic Garden from Circular Quay and the Sydney Opera House. The land along Woolloomooloo Bay, part of Sydney Harbour, was originally called Garden Cove and used for cattle grazing when the Colony of New South Wales was established at the end of the 18th century. Grand homes and elaborate gardens followed in the 1840s. Then Finger Wharf was built in 1910. The largest wooden structure in the world (at the time) was used by shippers and sailors, who were stationed at the nearby Royal Australian Navy’s Garden Island base. As Sydney grew, bigger and more modern wharfs were built. By the 1980s, Finger Wharf sat empty and was slated for demolition. But gentrification saved Wooloomooloo. 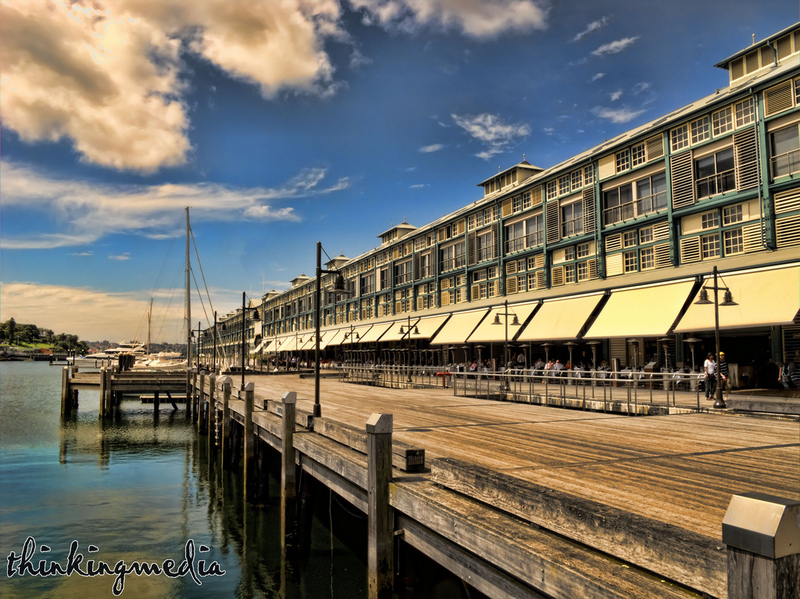 The blue-hued wharf was renovated and filled with luxury apartments, chic restaurants, and hip bars. Celebrities bought penthouses with harbor views. Superyachts started docking. Plus a design hotel with a view of the city skyline opened. 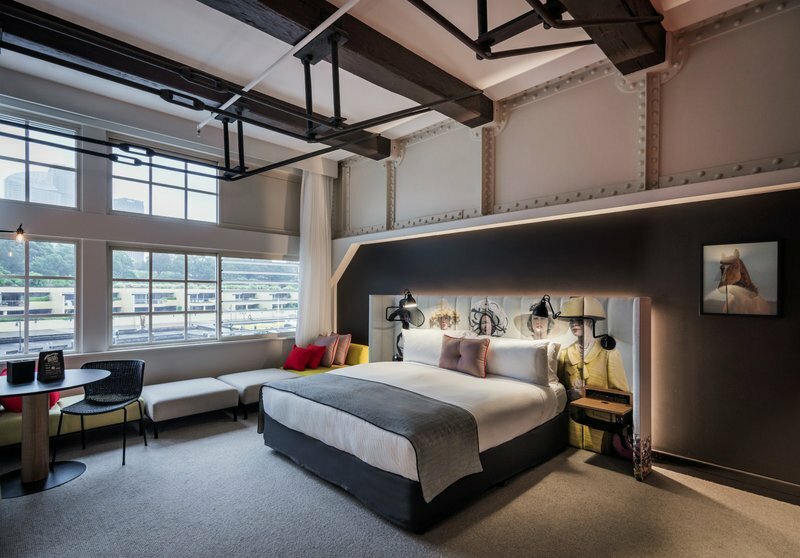 Ovolo Hotels, a Hong Kong-based company, opened Ovolo Woolloomooloo in a former wheat and wool warehouse. It kept exposed support beams, metal wheels, and conveyor belts from the original pier. A glass ceiling was added to the lobby. Early 20th-century photographs of Sydney were hung down the long corridors. While odd-shaped rooms were decorated with vibrant colors, modern art, oversized headboards, and electric blinds. Cool amenities were added, too. There’s an iPad in each room; speakers are connected to Spotify. The mini bar is free. So is breakfast and a social hour, featuring drinks and snacks, each evening. Ovolo Woolloomooloo is also home to two of Finger Wharf’s coolest hangout spots. Its restaurant, Alibi, serves plant-based dishes and bespoke cocktails. Kimchi dumplings, beet hummus, kelp noodle cacio e pepe, and polenta verde are some of the dishes on the eight-course tasting menu. Cocktails, like Rita’s Garden and the Rosato Spritz, look like works of art. Then there’s the Lo Lounge. The playful space is littered with illuminated trees, retro arcade games, and hidden workstations. Swarovski crystals dangle overhead. Plus coffee shops, bakeries, and sandwich cafes are just steps away. It looks like you may have a new favorite neighborhood in Sydney.